Samus is no longer the only playable Metroid character in Smash. She’s now joined by Ridley, a menacing space dragon who refuses to die no matter how many times he gets owned. To the casual observer, this is just a neat little thing. To Smash diehards, though, it’s the culmination of years of requests. And memes. Over the years, these words have been interpreted and re-interpreted by the community, which broadly settled on the notion that Ridley wasn’t playable because he was too big. It became a sticking point each time a new Smash roster was revealed. Where’s Ridley? When it became apparent that he wouldn’t be on Smash 4's initial roster, people mourned with an outpouring of half-ironic, half-sincere memes. That was followed by DLC requests all throughout the game’s lifespan. You can probably guess what happened next. 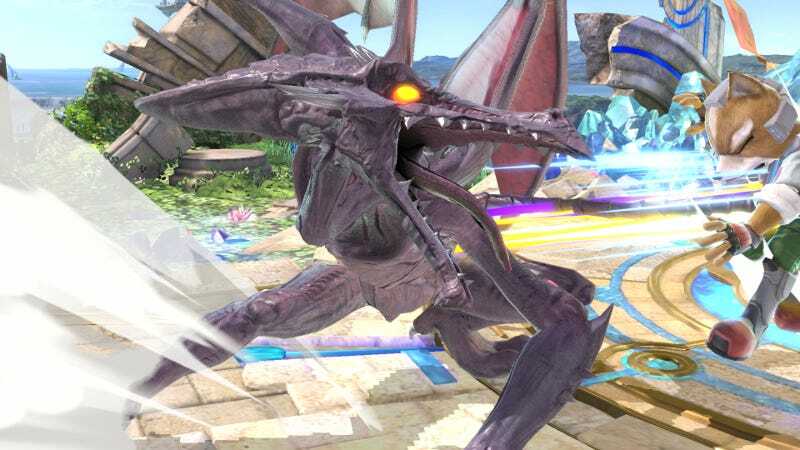 Ridley stans entered a tearful hibernation, only to go absolutely bonkers when the new Smash was announced. For the past couple months, places like the Smash subreddit, Twitter, and Tumblr have seen new Ridley and Ridley-adjacent topics and memes on a near-daily basis. People comparing his size to Bowser and pondering why he couldn’t just be shrunken down a little—or even turned into a baby. People pre-mourning because they were certain Nintendo would skip Ridley again. People asking if the whole thing came from a place of sincerity, or if it was just a never-ending maze of memes (answer: both). Yes, this is real life. No, you’re not dreaming. Anything is possible. Chase the stars.